TRUE NORTH features in CNN’s top 10 world’s most adventurous cruises! Come see it for yourself in 2014. (CNN) — “Cruising” — the word conjures up images of overflowing buffets, arm-wrestling at the soft serve machine and death by deck quoits. But there’s another side to this kind of travel that spits in the eye of the stereotypical deckchair-hogging cocktail sipper — and that’s adventure and expedition cruising. It’s truly “adventure by ship” where the often exotic destination is as much part of the attraction as the way you get there. These floating adventures take the form of anything from five-star Champagne explorations to ambling along in a tramp steamer. No, not the land of nodding Elvis Presley dolls and plastic grass skirts. Over at Big Island, adventurous vacationers can get aboard the Safari Explorer with just 36 others and, in between kayaking, hiking among volcanoes and dolphin spotting, engage in a mesmerizing ballet with manta rays. The cruise visits islands such as Moloka’i, a kind of frangipani fortress housing the true Hawaiian “aloha” spirit, and Lana’i, where you can hunt and shoot and go horseriding. Un-Cruise Adventures, +1 888 862 8881, from $700 per person per night. Until only a few years ago, the fabled Northwest Passage was just a theoretical shipping route between the Atlantic and Pacific Oceans across the top of Canada. For centuries, people died trying to get through and some of them are still there, buried in permafrost graves. Now, with changing climates, the passage can be completed with more confidence and your bragging rights enhanced without fear of death. While you’re there, you can visit the Inuit communities who’ve lived on the ice for centuries. OneOcean Expeditions, from $600 per person per night. The 16th-century Dutch explorers wouldn’t have a bar of it. Australia’s northwest is so inhospitable, it’s even a challenge for the local Njikena and Punaba people who’ve lived there for thousands of years. 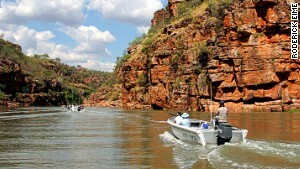 But this remote and harshly beautiful part of Australia is the country’s adventure cruise hotspot. Its season is from April through to September, when the torrential rains have eased and water cascades off the plateau. Infested with crocodiles and spotted with possibly the world’s oldest rock art, the Kimberley is in danger due to unchecked oil and gas exploration — you should go before it’s spoiled. True North Adventure Cruises, from $1,000 per person per night. Read more about TRUE NORTH’s Kimberley Cruises.